Tomorrow marks three weeks since surgery, and things are rolling along quite nicely. I am able to drink more liquid than in previous weeks, so on any given day it is not unusual for me to get in 13-14 8 ounce servings of water, so I’m getting nearly a gallon of water/fluid a day. I am still getting my personal minimum of 60 grams of protein a day, but I think the reason I am only getting in only 60 grams is that I am tired of drinking protein drinks. I am drinking them now because I have to, not because I want to. I know this is only temporary, but when your main source of protein for 6 weeks has been protein drinks that are sweet, and sweet is not something your palate particularly loves, it’s fatiguing and just gross because all you taste in your mouth is cloyingly sweet film left behind by the proteins and artificial sweeteners. Yuck. This week I get to try soft foods. I never once thought in my life I would be so excited to get to eat scrambled eggs and refried beans, but I am pretty freakin’ pumped about this possibility. The funny thing is, that when I was a child spending summers at my grandparents’ homes in New Mexico, scrambled eggs and refried beans was the staple breakfast! Were any of them alive today, I think they would be both amused that I can now eat these things on my eating plan, that I would be craving them something awful, and they’d be proud of what I have done to improve my health. This week’s loss puts me nearly out of The Range. Unless I hit the dreaded 3 week stall I keep hearing about, it is entirely possible that I could exit The Range by next Sunday. When I stepped on the scale this morning, I didn’t just see a number, I saw hope, I saw possibility, and I finally saw the light at the end of the tunnel. I can’t describe for you how I felt inside when I saw the number on the scale staring back at me–I will say that I stepped on the scale three separate times because I couldn’t believe what I was seeing–I even said out loud to myself, “I don’t believe it.” Once I stood there and noticed that the number wasn’t fluctuating, I grinned and entered my weight in MyFitnessPal and told my husband it was picture time. I am noticing though that I seem to lose weight like a snowman melts–from the top down, because my belly appears to persist even though the rest of me is getting smaller. This week saw me getting a bit more activity–more walking, and playing Wii tennis. My left side soreness is gone, so I wonder if that means my deep abdominal stitch popped? Not sure, but all I know is that it is no longer sore and I can do most of what I did pre-op, but I haven’t been cleared for full exercise until 3 weeks from now. So until then, I’ll increase my Wii tennis playing, add in some light weights for my upper body since I have been cleared for lifting 10-20 pounds and continue walking. This increase in activity will be important as I add soft foods and thus more calories to my daily routine. I have been getting between 300-500 calories each day for the past 3 weeks, but all of this has been coming from protein drinks and broths. Now that I’ll be eating soft foods, my calorie intake will be greater–likely between 600-800, but I’m aiming for 700–and my nutrient and vitamin intake will be greater. I have also been cleared to start taking my multivitamin this week. Prior to this week I had not been cleared to do so as my stomach healed. This is not to say it isn’t still healing; it is, but vitamins can be harsh on a freshly cut stomach, so my doctor’s plan does not have you taking vitamins until the 3rd week post-op. I have a bag of Celebrate Multivitamin Soft Chews waiting for me to bust into it starting tomorrow. I got a sample the last time I ordered something from Celebrate, and I really liked it–it tasted like an orange Starburst to me. So I’m looking forward to taking them. I also get to start my calcium supplement this week, so I made sure I got something that I would likely not forget to take every day–Calcet Creamy Bites in the lemon flavor. They say they taste and feel like cake in your mouth, so hey, that can’t be all bad, right? I have already been taking my B12 supplement since it is a sublingual and does not require chewing. I have missed taking my vitamins–prior to surgery, I took them every day without fail. I felt better, I had more energy and it was simply part of my routine. Not getting to take them for the past 3 weeks has been odd and is likely one reason (of many other obvious ones) why I haven’t had quite the energy I had before. So I’m hoping that the addition of vitamins to my daily eating helps bring my energy levels up. As I progress through soft foods back to dense proteins/regular food and create things for me to eat each day, I’ll probably start posting recipes with nutrition information here as well. The added accountability won’t hurt, and perhaps the recipes will inspire you to create your own healthy bites too. 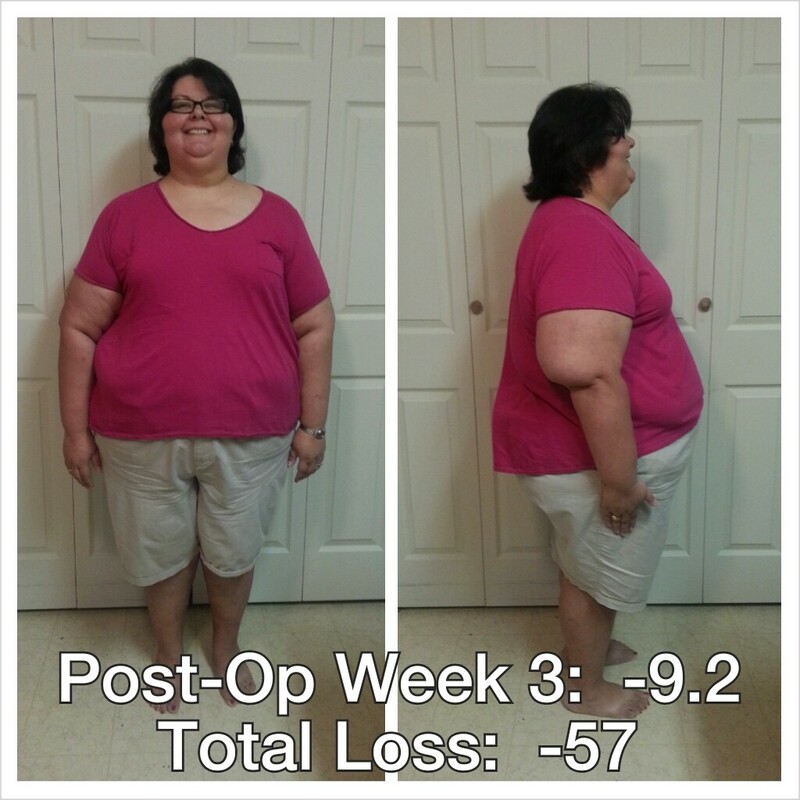 This entry was posted in post-op, progreso and tagged celebrate vitamins, photo post, post-op eating, post-op life, progress report, sleeve gastrectomy, vitamin supplements, VSG, WLS. Bookmark the permalink. Now I want your calcium. I haven’t tried the Calcet yet but I’m eager to! I love lemon flavored anything (just about) so I chose that flavor instead of the chocolate. Chocolate is wearing on me because all the protein drinks I’ve had in the past 6 weeks are either chocolate flavored or orange flavored. Jim suggested making a photo collage every week comparing the first week to each new week. I think it’s a great suggestion. So I did over in FB land. Congrats! I love reading your posts! So happy for you! Thanks! I’m excited for you and your progress as well. You are looking great!